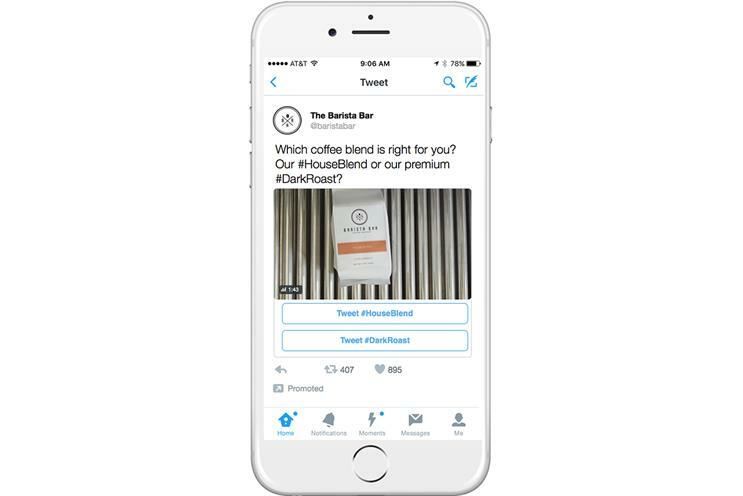 Twitter launched a new interactive ad format this week. Will the platform make a difference for brands? Conversational Ads is a new advertising format from Twitter that enables brands to create ads that users can then personalise and share with their own followers. In essence Conversational Ads are an evolution of Promoted Tweets, where brands can now include calls to actions with customisable hashtags designed to encourage engagement within Twitter. By clicking one of the calls to action a user will initiate a new Tweet window that will already contain a pre-populated Tweet with messaging crafted by the advertiser. It’s basically reducing the steps in the journey for any user looking to show some love and support for a brand – a complicated and slightly evolved version of a Facebook like? Or an Instagram heart? The potential pitfall, however, is that the user has full control over the contents of the final Tweet that is published to their timeline. An example of this format in application would be a brand asking its users on Twitter which of its products/models they prefer. Once a user has clicked their preference, they could then ask their own followers which of the products they prefer too. Twitter is looking for new and innovative ways to increase users, advertising spend and revenue, something they have been struggling to scale. In May 2015 Twitter’s stock price plummeted and hasn’t really recovered since, and as a result the social media platform has been rolling out a plethora of new ad products, such as Moments and Polls, in a bid to entice advertisers to the platform. However, stock performance hasn’t improved and earlier this year we’ve heard rumours that the platform may increase its character limit from 140 to 10,000. All in all, this paints a picture of a media brand that is struggling to find its way. How does Google make money? It’s a powerful aggregation point of consumer intent, collecting data at massive scale to facilitate the consumer journey. How does Facebook make money? It’s a sticky, aggregation point of demographic, social and interest-based data. These are assets of value to any brand and, whilst the ad products of both have constantly evolved, it has always been in the name of making the core product – the data – more powerful and more programmatically accessible for more brands. Twitter, by contrast, is yet to figure out its core or programmatic data model. What will it mean for businesses? With this advertising format, Twitter is giving brands the ability to empower their advocates and increase the reach of their message at no extra cost. That in itself is a powerful marketing tool. However, this is the product’s appeal in theory; in practice what is unclear at this stage is the incentive for users to promote your brand on your behalf. With no value exchange it is hard to foresee large-scale success. The option to enable users to personalise the Tweet before sending it out means that brands have to voluntarily release control. Twitter is already in a war with trolls, recently admitting that it's the number one business killer for them. But this ad format essentially makes every brand naked to the trolls. A large percentage of brand and consumer conversations on Twitter are complaints. This format could essentially amplify these conversations further and increase their visibility, meaning more work for community managers in order to protect brand sentiment. Is it a game-changer? No. It’s really just an iteration of Promoted Tweets, an ad format often maligned for its lack of relevancy and scalability. By figuring out its core ad product and the data model that powers it Twitter will improve the relevancy of its ad products, making them more accessible to more brands more of the time.